A good quality, Victorian copper mould. This mould has a couple of marks to the side. One is quite unusual. It is an engraved 'R' with laurel leaves around it. 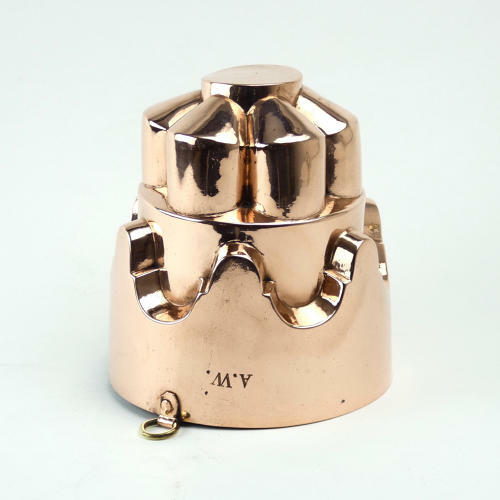 The other is the engraved initials 'A.W.' which would have been the initials of a previous owner. It dates from c.1870. The design is two tiered. When you look down on the top it is like a stylised flower and the lower section is a scalloped form. It is made from quite a substantial gauge of copper and it is in very good condition. The tinning, to the interior, is still good enough for the piece to be used. There is a small brass loop attached so the mould can hang.